Setting the Base Language translation. LibGuides supports several different languages, but we are happy to add more! If you're willing to help us add new language translations to LibGuides, please contact the Springy Support Team. Customizing default text and labels. Once you've set your Base Language, you can further customize the text you see throughout LibGuides. For example, if you want to change the wording of the search box's placeholder text, this is where you would go. Just about every piece of default text can be customized with your own wording. Please note: if you have LibGuides CMS, keep in mind that each group can also have its own Base Language and language customizations. When applied, these will take precedence over any system-level customizations you may have made. To customize your system's language options, go to Admin > Look & Feel and click on the Language Options tab. The Base Language sets the translation of the default text on your public pages, such as the homepage, A-Z Database List, and guides. This does not apply to any user-created content. For example, if the text in a Rich Text/HTML content item is in English, changing your base language to Spanish will not translate that text to Spanish. Rather, it will remain in English. 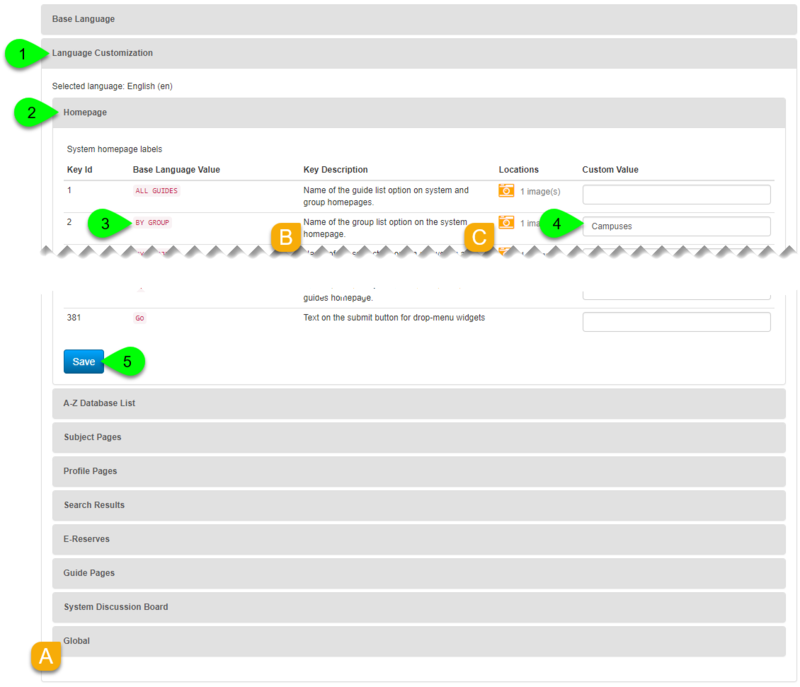 In the Base Language panel, select from one of the available languages in the dropdown. Don't see the language you want in the Base Language options? No worries! We'd love to work with you to add that language to the system. We enable your system to create a new set of labels in a language other than the ones that already exist in the system. You fill out every label with a translation. The initial translation should be as close to the English wording as possible in as general a dialect as possible so it can be used by all who speak that language. After the language has been created in the system, you can go back and tweak a label to represent your dialect or wording used at your institution. You let us know when you're done and we'll take your system out of Language Entry Mode. Once we do that you can select it from Base Language list in your system! The Language Customization options allow you to customize just about all of the default text displayed on your public pages. Whether you just want to customize the wording of a label, or tweak an individual translation, you can do it here. Click on the Language Customization panel to expand it. Text is broken up into different language keys, organized by location. Click on the panel for the location that contains the text you want to customize. Note: because some text is used throughout the system, be sure to look under the Global panel if you can't find it under a specific location. You can find the text you're looking for in the Base Language Value column. Each value will include a key description so you can see where the text appears. Some will also include a screenshot of the locations where the text appears, as well. Just click on the camera () icon where it appears. Enter the text you want to use in the key's Custom Value field. This will display in place of the base language value wherever it appears. When finished, scroll to the bottom of the list and click the Save button.